Animal bites can cause many different types of wounds. Bites can cause bruises, scratches, cuts, and puncture wounds. Animal bites are very dirty and can get infected. If there is redness around the bite wound after 1-4 days, this most often means it is infected. Bites on the hands are more likely to get infected. Cat bites and scratches often become infected. Some animals can carry rabies. This is a virus that can be very serious. Infected animals can give rabies to people by biting them. Any person with a bite from an animal that might have rabies should see a doctor. An animal bite that breaks the skin has a risk of tetanus. If it has been more than 5 years since the last shot, a tetanus booster is needed. A person with an animal bite that breaks the skin will most likely need to see a doctor. Bruising: with a bruise, there is no break in the skin. There is no risk of infection. Scratch: low chance of infection. Antibiotic drugs are not needed. Cut: some chance of infection. 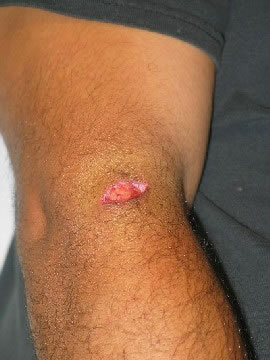 Cleaning the wound can help prevent this. Antibiotic drugs may be needed. Puncture Wound: greater chance of infection. Cat bites are more likely to get infected. Antibiotic drugs may be needed. Bites from wild animals are usually more serious. Some wild animals can have rabies. Rabies is a disease that can kill people. Bites or scratches from a bat, skunk, raccoon, fox, or coyote could have rabies. These animals may have no signs of rabies but can still give it to people. Rabbits, squirrels, mice, rats, and chipmunks will not give people rabies. Their bites can still get infected. People can also get bitten by pet animals. Small pets (gerbils, hamsters, guinea pigs, mice, rats) do not have rabies. Bites from small pets usually do not break the skin. Most often, a person does not need to see a doctor for these bites. Large pets, like cats or dogs, can bite deeper. These bites are more likely to get infected. Cat scratches can get infected just like a bite because cats lick their claws. Puncture wounds from puppies often do not need to be seen by a doctor. Puppy teeth are tiny and barely break the skin. What Animals Can Carry Rabies? Animal bites may cause bruises, scratches, cuts, or puncture wounds. You can treat minor animal bites at home. Put a gauze pad or clean cloth on top of the wound. Press down on the place that is bleeding with your fingers. This is called using direct pressure. It is the best way to stop bleeding. Cleansing: Wash all bites and scratches right away with soap and water for 5 minutes. Scrub enough to make it re-bleed a little. Rinse it with running water for a few minutes to avoid infection. Antibiotic Ointment: Put an antibiotic ointment (Neosporin, Bacitracin) on the bite 3 times a day for 3 days. Cold Pack: For pain or swelling, use a cold pack or ice wrapped in a wet cloth. Put it on the bite for 20 minutes. Repeat 4 times a day on the first day, then as needed. If pain lasts over 2 days, apply heat to the bite. Use a heat pack, heating pad, or warm wet washcloth. Do this for 10 minutes, then as needed. For widespread stiffness, take a hot bath or hot shower instead. Move the bite under the warm water. What to Expect: Bruises should go away over 7-14 days. The Animal Control Center needs to know about any animal bite (or other animal contact) that might result in rabies. If you go to the emergency department or to your doctor, they will call the Animal Control Center for you. If you do not go to the doctor, you should call the Animal Control Center and tell them about the bite. You can report the animal to your local Animal Control Center. This laceration near the right elbow was caused by a dog bite. The laceration is gaping open. This laceration needs medical evaluation and copious wound irrigation. 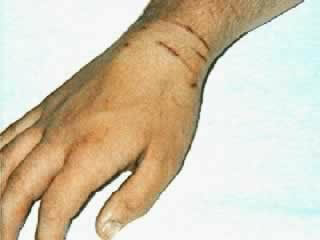 Sutures may or may not be used, depending on the judgment of the treating physician. A clean wound like this from a knife would be sutured closed. But an animal bite carries a higher risk of infection and this will need to be considered by both physician and patient.